Kidderminster Harriers sit in 10th place as they welcome the 8th placed Blues tomorrow – the hosts having a new name back in their dugout. Manager Mark Yates has returned to Harriers for his second managerial spell at the club. He left Macclesfield in League Two earlier this season after a winless start, but masterminded Solihull Moors’ survival in the National League last term. Yates was in charge of Kidderminster in what was his first taste of management between 2006 and 2009 before leaving for Cheltenham Town. 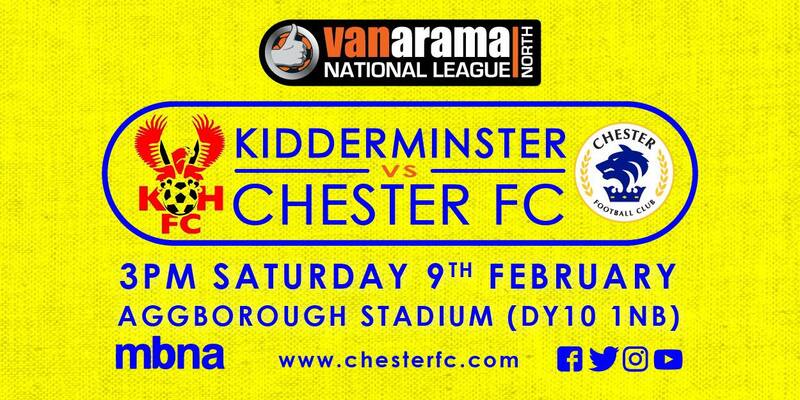 Chester hope to welcome back recent absentees Anthony Dudley and Akwasi Asante tomorrow. A timely boost for a side that dropped out of the Play-Offs after defeat to Spennymoor 13 days ago. However, they had encouraging moments in a loss against one of the promotion favourites away from home. If the reverse fixture is anything to go by, we should be in for a cracker tomorrow. It was an electric night down the Swansway in September. Kidderminster were beaten for the first time on the road, as the Blues defeated them 3-1. Matty Hughes bagged a brace with top scorer Anthony Dudley also slotting home from the penalty spot. More of the same tomorrow would be very nice indeed! Kick off tomorrow at Aggborough is 3pm. The Sat Nav postcode for the stadium is DY10 1NB.